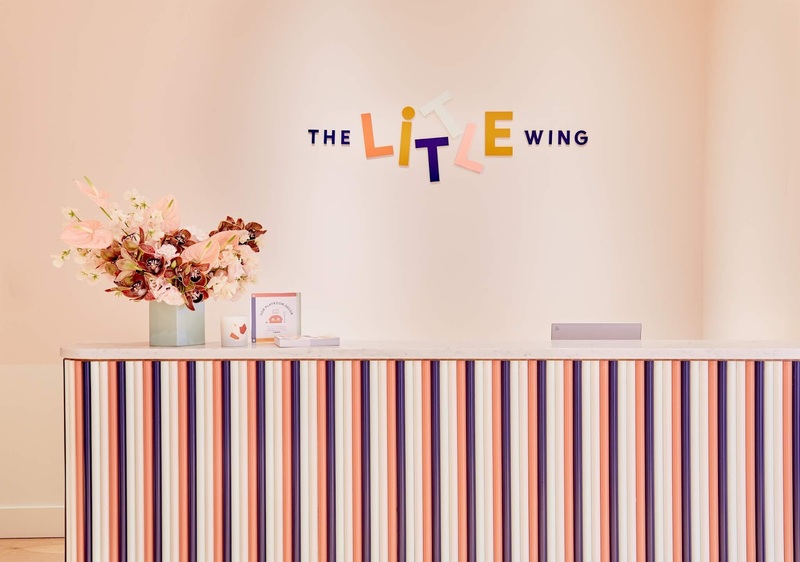 baby meets city: The Little Wing (at The Wing) Has Opened! The Little Wing (at The Wing) Has Opened! Have you heard about The Wing? Perhaps seen photos of perfectly color coordinated bookshelves & heard whispers of their women's empowerment vibe on social media? I got to experience the women's community space on Monday, and let me tell you, it lives up to the hype. The airy loft space in Soho, which, like all their locations offers a gorgeous place to work, take meetings & quiet phone calls, shower & freshen up, eat organic meals in the cafe, and after hours, attend networking and speaker events with the likes of Hillary Clinton and J. 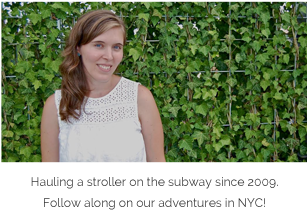 Lo-- now goes one step further: childcare! 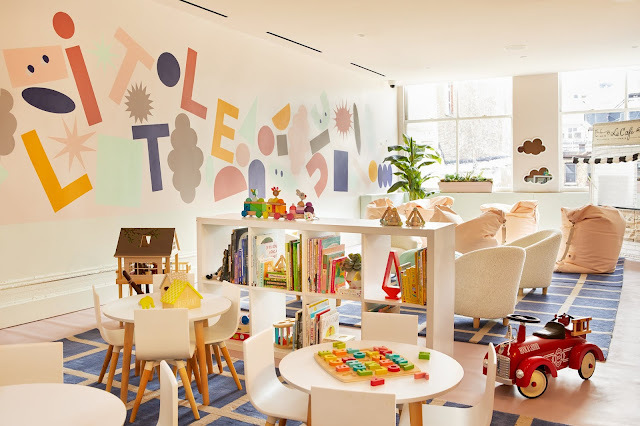 Yes, you can now drop off your little one (between the ages of 1-6) at their Soho location for a two hour block of time while you work upstairs (or hey, just enjoy a quiet moment with a cup of coffee). CPR and First Aid-certified Wing-sitters will engage with your child through weekly themes and activities in their cheerful play space. 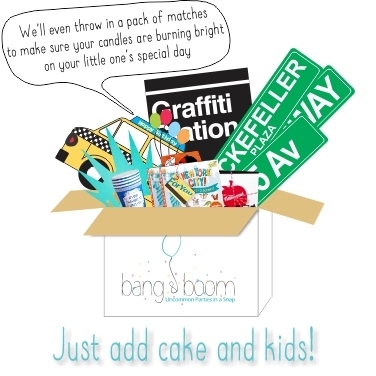 2 hour windows can be booked for $25, which as we all know, is cheaper than a regular babysitter. Enrichment classes like music, theater, yoga and art will be offered for $28/class, and an open play from 9am-1pm is offered for $25 on the weekends. The Little Wing will also offer parent support groups and workshops to help guide mothers in their journey as parents. 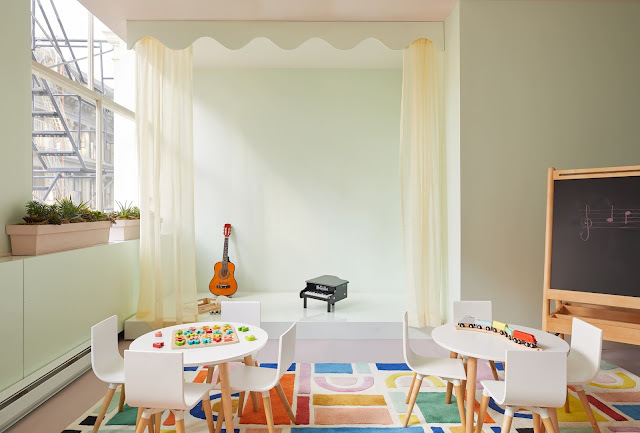 And while the Soho location is the first Wing to offer childcare, founders Lauren Kassan and Audrey Gelman intend to include a Little Wing in future locations as the social & co-working club continues to expand. Three cheers to that! I was really taken with the whole vibe at The Wing. It feels both uplifting and empowering that there is a place dedicated to women's ambition and leadership in what we all know is a changing, yet still male-dominated world. For membership inquiries and more information, please visit their website. Photos are by the talented Emily Gilbert.